A candidate for the "wine of the vintage," Pontet Canet's 2008 boasts an opaque purple color as well as copious aromas of sweet blueberries, blackberries and black currant fruit intertwined with lead pencil shavings, subtle barbecue smoke and a hint of forest floor. Full-bodied, with fabulous richness, texture and tremendous freshness, this first-growth-like effort is more developed than the uber-powerful 2010. Give it 5-8 years of cellaring and drink it over the following three decades. Bravo! Drink 2016-2046. A wine for our children's children. Nobody in Bordeaux is more attentive to detail than Alfred Tesseron is at Pontet-Canet. Fashioned from incredibly low yields, a very late harvest, and a Draconian selection, the 2008 will not be close to drinkability for at least a decade, and it should still be in superb form circa 2060. An absolutely amazing effort, it boasts an inky/black/purple color as well as an extraordinary bouquet of creme de cassis, graphite, charcoal, and incense, blockbuster depth, and full-bodied power. The tannins are high, but they are remarkably velvety as well as well-integrated. Sensational acidity gives the wine precision and vibrancy, but the impression is one of massive concentration and power. The 2008 Pontet-Canet, a candidate for the wine of the vintage, is a tour de force in viticultural precision and winemaking savoir faire. Tasted at the UGC 2008 tasting in London. 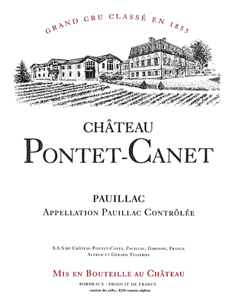 The Pontet-Cantet 08 has a rich, almost decadent bouquet with black plum, espresso, vanilla and a touch of coca, unashamedly modern in style but retaining good definition. The palate has very fine grip and backbone, a savoury edge on the entry, touches of white pepper and tobacco dominating the finish that has real persistency. It has a certain -gloss- that I think it will shed over time and it needs to meld together on the finish, but it will reward those that can resist its youthful decadence. Drink 2015-2035. Tasted October 2010. A limpid deep ruby colour. The nose has wonderful definition, very pure with crème de cassis, black plum, a touch of graphite and cedar. It has certainly become less flamboyant and more precise since tasting out of barrel. The second bottle in October 2009 has an added dimension of fresh tangerine. The palate is full-bodied, firm tannins, quite attacking on the front palate, strong Cabernet flavours with that seam of graphite running from start to finish. Blackberry leaf, a touch of black plum and cassis struck through with vibrant acidity. Quite sinewy and less fleshy that I remember but undoubtedly a classy wine. Coming back after ten minutes, the 2008 has more puppy fat than the 2005 and the wine is finally revealing its cashmere finish. Drink 2013-2030. Tasted October 2009. A blend of 65% Cabernet Sauvignon, 4% Cabernet Franc, 1% Petit Verdot and 30% Merlot. We learnt a lot after 2007. A deep purple colour. The nose has very good intensity, brambly black fruits, a touch of boysenberry, a hint of the Thames estuary, a slight clayey scent although it is more akin to mudflats. Good definition. With aeration it starts to gain cedar scents. The palate is full-bodied with firm, grippy tannins, pure blackberry, cassis, blueberry, this is a Pauillac that really lacquers the mouth. Great persistency on the finish with a touch of black pepper and violets right on the aftertaste. Excellent. Tasted three times, the sample at a negoçiant showing a little more tension and structure. Expressive dark fruit and sweet citrus freshness. Deep and mouthfilling, deep pile tannins, finishing fresh and satisfying. Plenty of freshness on the finish. Drink 2013-2020. The freshness of the raspberry and loganberry on the nose ensures fragrance and tends to lighten the start of the palate. Behind this red fruit front is cassis and plum enriched by sloe. Rounded tannins allow the flesh of the fruit to win through.